Heather Neil is the Blended/Personalized Learning Coach for the Woonsocket Education Department. Follow her on Twitter @hneil75 and check out her Fuse Fellow profile for more information. Heather often collaborates with Beth Campanelli, Woonsocket’s Speech Department Head. Here, the two co-lead a training on the ONEder platform held at Woonsocket Middle School at Villanova on January 19, 2018. In mid January, I joined Cohort 1 Fuse alumna Heather Neil during a small part of her busy day supporting the Woonsocket School District. As the Blended/Personalized Learning Coach districtwide, Heather’s days often include stops at multiple buildings. First up, I sat in while Heather co-led a training on the ONEder platform. I chatted with Stacie LeClair, an elementary-based occupational therapist and a colleague of Heather’s. 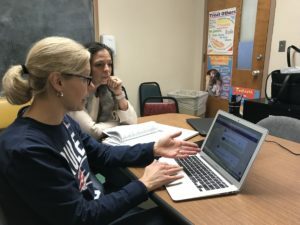 She praised the level of communication between Heather and Beth Campanelli, the head of the speech department, and pointed to their collaboration as a key to successfully supporting students who require additional services. 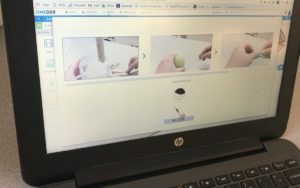 Stacie was excited by the power of the ONEder tool for sharing both verbal/written and nonverbal directions with young learners, sharing resources across general education and special education classrooms, and modeling cognitive and motor skills. We discussed the larger trend of starting blended initiatives with just core content teachers, and how that often leaves specialists, therapists, and special educators with little support or inspiration for their own contexts. After this training, it was clear that the team I observed had built plans and videos that they could bring to their students the very next day. Stacie LeClair, an occupational therapist in Woonsocket, displays some video instructions she’s built for students. Next, I followed Heather to a one-on-one coaching session with Deb Steers, a fourth grade teacher at Bernon Heights Elementary School. They have had multiple coaching visits together in the past few months as Deb continues implementing blended learning strategies in her classroom this school year. During this visit, Deb brought some problems of practice to the table and Heather guided her through several potential solutions. Formative assessment was a big focus area, and Deb was looking for ways to make the data collection process more efficient. She was also interested in learning more about organizing tasks for students to work on both collaboratively and independently without the teacher. Over the next few days, students would be learning about the three rock types, and building their own presentations with their groups to show what they’d learned. Heather works with Grade 4 teacher Deb Steers during a coaching session at Bernon Heights Elementary. 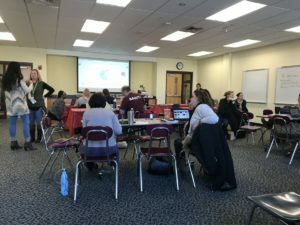 Heather works with many individual teachers in Woonsocket who are excited about integrating more collaboration, choice, and digital resources into their practice. Now that blended learning has been a focus for several years in a row, she’s seeing progress in many of the rooms she’s supported. The district’s teaching partner program has been invaluable for prioritizing this special form of job-embedded professional development. In practice this means that Heather can see a teacher in action, and then debrief/co-plan while the assigned teacher partner covers the teacher’s class. She’s buoyed by the increasing demand amongst teachers new to this shift in education. To work with Heather, teachers submit coaching request forms, and the flow of those requests has steadily increased since the beginning of the school year, particularly at the elementary schools. By laying the foundation with K-5, the momentum is starting to build toward expansion into the upper grade levels. The district is excited to grow the implementation of blended/personalized learning to its secondary level, beginning with a 1:1 Chromebook rollout at its middle schools. Streamlining the user experience for both students and teachers has been a major priority. 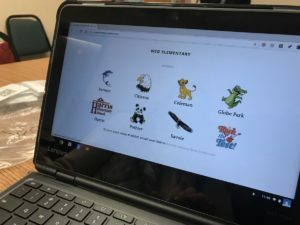 This screen shows a glimpse of how Heather and her team have utilized Clever badges to make the sign-on process more efficient for each school. The discussion topics are also increasing in depth, which is an encouraging sign. According to Heather, “early on this year my role was mostly about device deployment, simply because there’s only 1 of me districtwide. Now, my big focus is small group instruction and emphasizing that pedagogy drives the purposeful integration of technology. Tech is a tool in getting toward more quality small group time and other opportunities to get to know students.” Next will be ramping up the rigor of collaborative and tech-assisted activities. Just as teachers aim to personalize for their students, Heather recognizes the vast range of needs and availabilities of the teachers she works with, and makes a point to lead with empathy and an open-minded approach to problem-solving. 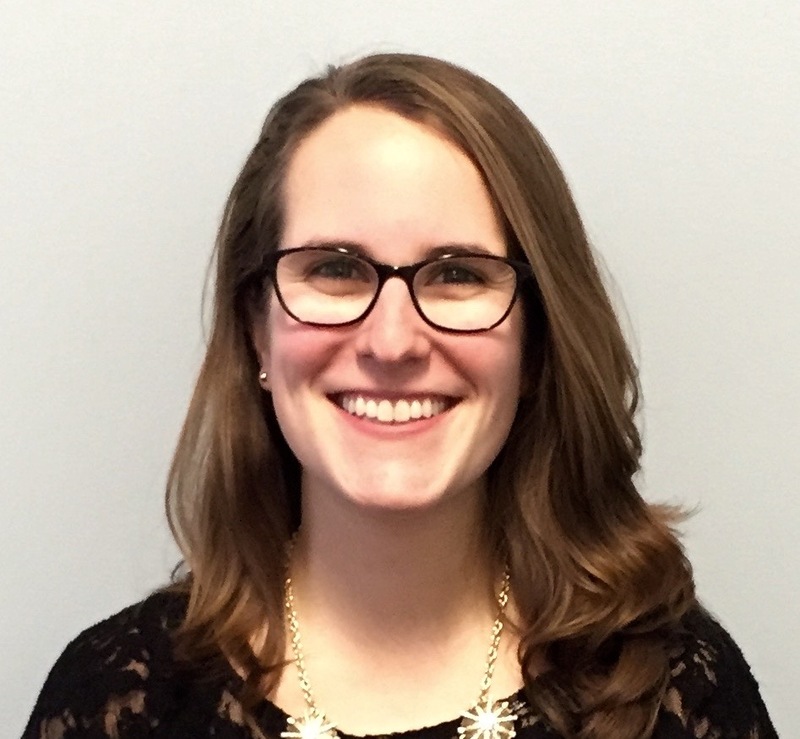 Heather is currently an active participant in another Fuse program – Fuse Classroom – an offshoot of the Fellowship that partners individual teachers and coaches across districts statewide. She’s been instrumental in showcasing the great work of her Woonsocket team and leading important conversations around the roles and responsibilities of educators today. She’s excited to see this same type of collaboration spreading organically with the early adopter teachers she now coaches in Woonsocket. They’re becoming point people for questions from their colleagues, and the conversation is expanding.